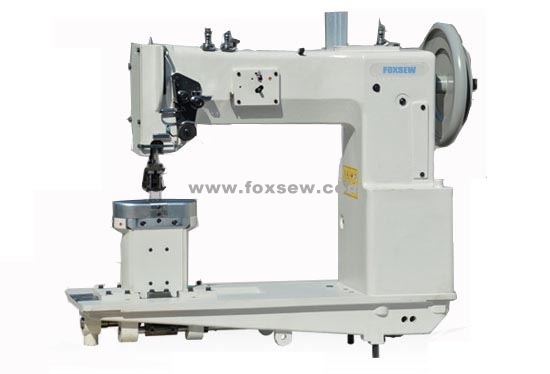 FOXSEW Extra heavy duty post bed double needle compound feed with walking foot lockstitch upholstery Sewing Machine with two extra large vertical axis hooks (for braided thread up to 1.0 mm); ornamental stitch sewing machine for decorative seams on leather. Applications: assemble and topstitching leather sofas and furniture, car seat covers, automotive upholstery, car interiors, marine upholstery, shoe uppers, handbags, jeans, tarpaulins, covers, awnings, tents, umbrellas, luggage, travel ware accessories, sports and camping equipment, wearing apparel, outdoor clothing, footwear, foundation garments and orthopedic appliances. Features: For sewing extra heavy weight materials such as fabric, plastic, leather, webbing, fiberglass, Kevlar, rubber; Compound feed and walking foot mechanism assures even feeding of materials;High needle penetration power and excellent climbing capacity guarantee easy sewing thick spots or cross seams(over transversal seams), without skipped stitch, loose bottom thread, shorten stitch length, bobbin thread Knots and Tangles; The sewing foot stroke up to 9 mm allows the safe climbing over differently high material plies; Pneumatic additional thread tension for excellent stitch formation when sewing over thick spots or overlapping seams; Up to 12 mm long stitches for decorative topstitching seams; Thread puller is available for even thread tension; Front tape guide is available for double stitch with under tape strengthening, saddle stitch and top stitch; Piping cord insert is available; This machine is an ideal replacement of Durkopp Adler 868-290321 and Durkopp Adler H868-290361. Looking for ideal Post Bed Compound Feed Upholstery Sewing Machine Manufacturer & supplier ? We have a wide selection at great prices to help you get creative. All the Post Bed Heavy Duty Upholstery Sewing Machine are quality guaranteed. We are China Origin Factory of Extra Heavy Duty Post Bed Upholstery Sewing Machine. If you have any question, please feel free to contact us.